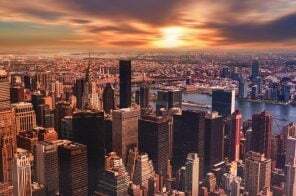 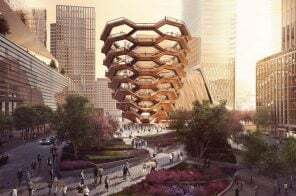 The temporary bronze sculpture that has attracted millions of tourists and locals could become a permanent fixture in New York City, according to Adweek. 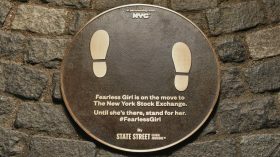 Commissioned by State Street Global Advisors, the Fearless Girl statue was installed last March, a day before International Women’s Day, sending a message to Wall Street for the need of gender equality in the financial world. 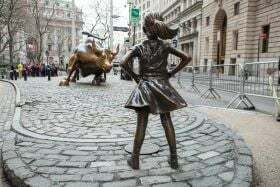 With her chin up and hands firmly on her hips, the 250-pound statue defiantly faces the iconic Charging Bull statue, which has stood in the same spot since 1989. 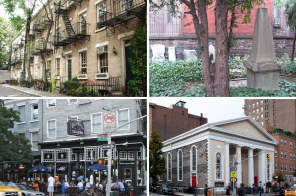 And now the city might relocate the pair of statues from Bowling Green Park in lower Manhattan to another, more pedestrian-friendly home to ease safety concerns.